Rachel Morgan is a runner with the Inderland Runner Services, apprehending law-breakers throughout Cincinnati. She's also a witch, one of the many Inderlanders who revealed themselves after a genetically engineered virus wiped out 50 percent of humanity. Witches, warlocks, vampires, werewolves-the creatures of dreams and nightmares have lived beside humans for centuries, hiding their powers. But now they've stopped hiding, and nothing will be the same. On the run with a contract on her head, Rachel reluctantly teams up with Ivy, Inderland's best runner...and a living vampire. But this witch is way out of her league, and to clear her name, Rachel must evade shape-changing assassins, outwit a powerful businessman/crimelord, and survive a vicious underground fight-to-the-death...not to mention her own roommate! 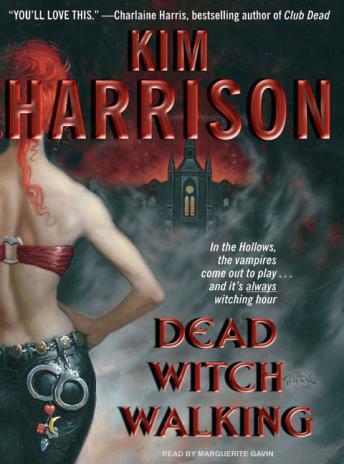 Fun, sassy, filled with action, humor, and romance, Dead Witch Walking is the perfect summer listen for anyone who likes vampires, paranormal fantasy, romance, or just a great beach book. Great Series. The Detective Agency from the Hollows is a great thrill.